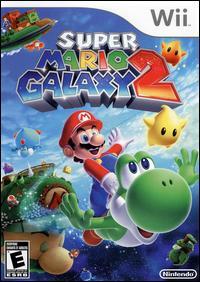 Super Mario returns for more out-of-this-world adventures in this sequel to 2007's top-selling Wii title. Joining the famous plumber is friendly dinosaur Yoshi, who Mario can ride after finding an egg on a level. The platform-style play mechanics closely follow the first game's, albeit with new levels, puzzles, collectibles, and power-ups to master. As in previous games, Yoshi can grab items with his tongue and spit them back at enemies. His sticky tongue can also be used to swing across chasms to reach new areas. Yoshi can also consume different foods for added powers, such as dash peppers for quickly scaling vertical walls or blimp fruits to swell up like a balloon and float. New gadgets for Mario include a drill that allows the plucky plumber to drill through a planet's surface until he reaches the other side. Each 3D planet once again offers gravity-specific challenges to overcome, from working upside down to gliding from area to area. Super Mario Galaxy 2 also introduces "comet metals" to collect, which will gradually open up new, more difficult levels with additional challenges to conquer.